DETROIT -- General Motors will expand its Super Cruise semiautonomous highway driving system to brands other than Cadillac after 2020. The technology will eventually be available on all of the automaker's U.S. vehicles, according to GM product chief Mark Reuss. 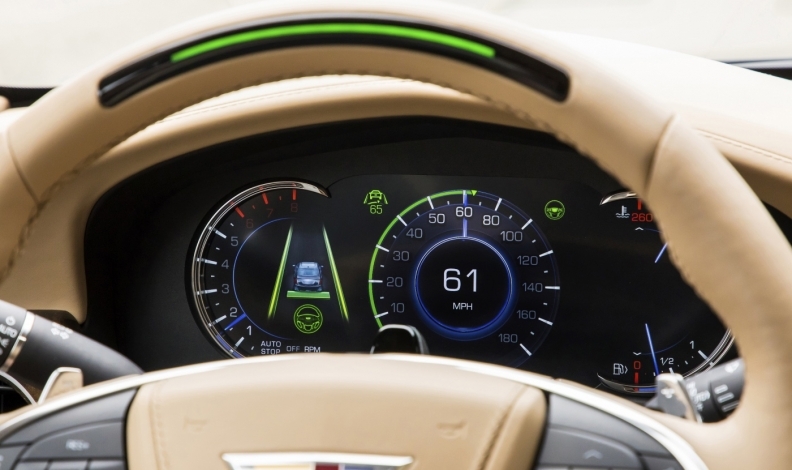 The expansion, GM says, will occur after the company begins rolling out the hands-free driving system across Cadillac’s lineup in 2020. Executives had previously said the automaker would expand the technology to other brands. However, they had not released a time frame for the rollout. Reuss, during a presentation at the Intelligent Transportation Society of America conference, also announced plans to offer vehicle-to-everything (V2X) communications in a high-volume Cadillac crossover by 2023. That technology, he said, also will eventually expand across the brand’s portfolio. “These announcements demonstrate both our intention to lead in technical innovation, and Cadillac’s place at the tip of the corporate spear when it comes to rolling out that innovation,” Reuss said. Reuss’ comments reaffirm GM CEO Mary Barra’s pledge in a keynote address at the 2014 ITS World Congress, where she announced Cadillac would begin offering advanced intelligent and connected technology in its vehicles. GM introduced vehicle-to-vehicle (V2V) communication on the Cadillac CTS sedan in 2017. It allows the cars to communicate with other vehicles with the technology, including passing 1,000 messages per second to track each other's positions, direction and speed to help avoid crashes. The company said it is using V2V as a base for V2X that can notify drivers of hazardous road conditions, traffic light statuses, changing work zones and possible crash threats. The expansion of both technologies is the first major announcement for Cadillac since GM ousted Cadillac President Johan de Nysschen in exchange for Steve Carlisle, head of the company's Canadian operations, in April. Carlisle, in a statement, said the brand is "proud to be the leader for the company's innovation." GM introduced Super Cruise on high-end trims of the 2018 Cadillac CT6. The system operates through precision lidar mapping, high precision GPS, a driver attention system and a network of camera and radar sensors. Customers can drive hands free on more than 130,000 miles of limited-access freeways in the U.S. and Canada. The system keep drivers engaged through a light bar on the steering wheel and detects when they may need to pay more attention to the road.